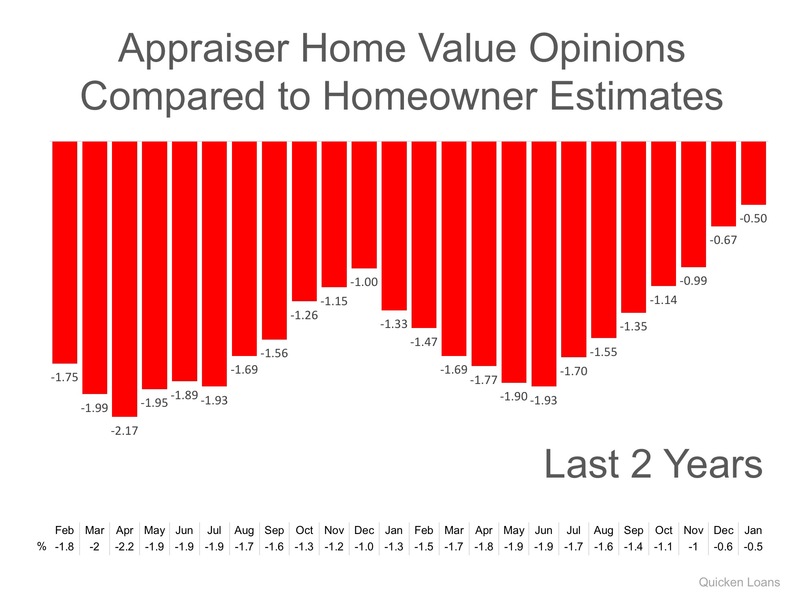 Gap Between Homeowners & Appraisers Narrows to Lowest Mark in 2 Years. In today’s housing market, where supply is very low and demand is very high, home values are increasing rapidly. Many experts are projecting that home values could appreciate by another 4% or more over the next twelve months. One major challenge in such a market is the bank appraisal. Your House Must Be Sold TWICE. In today’s housing market, where supply is very low and demand is very high, home values are increasing rapidly. Many experts are projecting that home values could appreciate by another 5%+ over the next twelve months. One major challenge in such a market is the bank appraisal. If prices are surging, it is difficult for appraisers to find adequate, comparable sales (similar houses in the neighborhood that recently closed) to defend the selling price when performing the appraisal for the bank. Every month in their Home Price Perception Index (HPPI), Quicken Loans measures the disparity between what a homeowner who is seeking to refinance their home believes their house is worth, and an appraiser’s evaluation of that same home. “Based on the HPPI, it appears homeowners in the markets where prices are rising faster than the national average – like Denver, Seattle and San Francisco – are continuing to underestimate just how quickly home values are rising, so the average appraisal is higher than homeowner estimate. The chart below illustrates the changes in home price estimates over the last 12 months. Get The Latest Listings Sent Straight To Your Email.